Words cannot begin to describe the Grand Canyon. It is a place that you have to see in person. I had been before, but this was to be Anne's first visit. 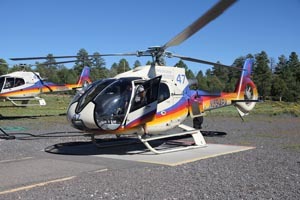 We had a helicopter flight booked with Papillon flying from the Grand Canyon airport at Tusayan. In order to keep the canyon a surprise, instead of driving straight to South Rim, we stayed in Tusayan before the time of the flight. That way the first view of the canyon was from the air after a few minutes of flight over the tree tops of Kaibab forest. And what a view. Suddenly the flat land leading up to South Rim gives way to the mile deep chasm of the Grand Canyon. Taking photos wasn't that easy, although I managed to avoid reflections from the windows and shot fast enough to avoid blurring from the vibrations of the helicopter. The views were fantastic so it was easy to fire off hundreds of shots. But after 30 minutes of flying we began to feel a little queasy from the constant juddering. After the full 45 minutes we were actually glad to land back at Tusayan. We drove up to South Rim but it took a while of walking on terra firma to feel normal again! After South Rim we drove east along the canyon's edge to Desert View, getting there about half an hour before sunset. I managed to get some lovely photographs of the canyon as it turned a rich red in the fading light. Leaving Desert View in the dark we came across a moose in the middle of the road at one point, not something you see everyday back home!